Listening to these people on the streets in Whitehorse made me think a lot about why we celebrate fathers (and mothers) and why it’s important to do so. Not so much that I have to thank my own father for what he’s done for me, my brother and our sisters, what he sacrificed for us (although that's important too), but to celebrate fatherhood in general. It’s around this time of the year that we hear (mainly from groups like Focus on the Family) about the “crisis of fatherhood.” I mentioned this to a friend the other day and he sarcastically threw it right back at me, “Crisis?” as if I was making a big deal out of nothing. Fatherless children are at a dramatically greater risk of drug and alcohol abuse. Children from single parent homes have more physical and mental health problems than children who live with two married parents. Boys in single parent homes have more illnesses than girls in single parent homes. Children in single-parent families are two to three times as likely as children in two-parent families to have emotional and behavioural problems. Three out of four teenage suicides occur in households where a parent has been absent. The list goes on. Whether causation can be proven or merely correlation, I don’t think these statistics can be ignored. On April 9th we aired a Perspectives: The Weekly Edition episode on men. Our guests were Fr. Chris Valka, Jason Genaro and Jay Wall. We spoke a lot about the intrinsic God-designed differences between men and women. Afterward, Jason and I continued our conversation (for about another couple of hours) with respect to fatherhood. Jason was very clear about why God is Father. That is not a coincidence. Jesus was very clear about calling God "Father: – that’s not because of the patriarchal society of the day. There is something very male and very fatherly about God. But what is that? (I’d love to hear your comments on that.) What I do know is that there is something about fatherhood that's important, not just that we all need fathers, but there's something Godly about it. This week I was also speaking with Brian Caulfield of the Father's For Good campaign of the Knights of Columbus. It's an initiative for fathers, with resources and models to help them - because many fathers need help. Brian was also very clear about why there is a crisis of fatherhood and why that crisis is related to the denial of the fatherhood of God.You can listen to my conversation with Brian on this week's S+L Radio podcast. I may not fully understand it, but I am sure that's part of it: the crisis of fatherhood has to do with denying the Fatherhood of God and when we deny God’s Fatherhood, we are missing out on something invaluable. In this week's Perspectives: The Weekly Edition, we speak about parenting and I asked my two guests, Lisa Canning and Patrick Douglas if they thought there were specific gender roles for parents - and I meant God-designed roles. They both said yes. We're still trying to figure this out, but I am sure there is a difference. If you doubt it, just note how differently Father's Day is celebrated from Mother's Day: For mothers,quite often, the day is celebrated by giving her a break from her motherhood chores. She gets to sleep in. Breakfast is served in bed. Her family takes her out to dinner. No work for mother today. Dad does the parenting for the day. For fathers it's slightly different. No break for dad from being dad today. This is the day for them to be dads. They get to get up and do something with their kids. Often mother leaves them so it's just dad and the kids. Perhaps that's partly because there is a crisis. Fathers need to celebrate Father's Day with their children, because so often they are not present to their children. And when fathers are not present, it makes a huge difference, one that we cannot measure or understand fully. How do we combat this crisis? Well, we get fathers back in the family. But don’t be the fathers that are involved only to the extent that their jobs allow them to: Really be there. Be the one who gets up in the middle of the night – stay up and watch TV or a movie with your kids. Take them out for dinner – be home for dinner, not just once a week, but more often than less. Be there when they leave home to go to school – drive them to school. Go to school events. Coach their hockey or soccer team. Be the one who drives them and their friends to wherever they are going. Realize that all they want is to spend time with you, doing whatever; they don’t really want that new iPod. Pray with them. Pray for them. Apologize to them when you are wrong. Play games with them. Bless them. And love their mother. Help their mother. Love their mother, for the greatest gift you can give your children is to love their mother. I know that it seems that I am speaking only to the fathers who are married, whose wife is supportive, who can make time, or take time from work to be with their children, but I am not. Some of you may be separated or divorced. Some of you feel you've failed as a dad. Some of your children live with their mothers and you never see them. Some of you are single dads. Some of you have to work more than one job to make ends meet. But you can still be present to your children. You can still let them know, in everything you say and do, that they are first in your life. If circumstances do not allow you to do that, then perhaps you need to consider making some life-changing choices. If you feel it's too late, that you're already older and your children are long gone - perhaps you haven't spoken to them for years and feel a bit of regret. Pick up the phone. That's all it takes. Do it. Don't let pride get in the way. I can guarantee you that your adult children want nothing more than to hear your voice, to hear your apology, to hear your blessing. Next thing I knew, I had tears streaming down my face. I realized in that moment, as I looked at little Nicolas, through my rear-view mirror, that he is my vocation. He and his brother, Daniel are my true vocation. All the award-winning, life-changing TV programs or documentaries I make will never be more meaningful or important than being a dad to my children – and, in order to do that well, I have to be a husband to my wife. 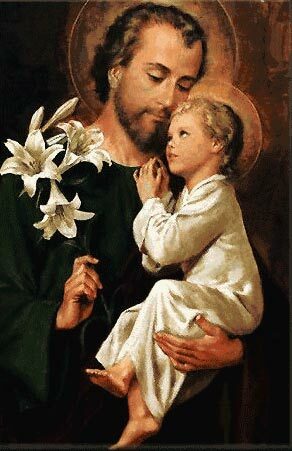 Joseph may have been praying about Jesus, but I also realized that we are all children of God and so, “How can I be father to a child of God?” also applies to all fathers. “How can I raise a king?” is also my vocation, for we are called to raise all our children to be kings and queens, to reach their full potential – to be their fullness as sons and daughters of God. How can I be a father to the son of God? How can I raise a king? I can’t. Not by myself. And that is why we need grace. And that is why we need community. And that is why we need to celebrate fathers on Father’s Day. Because their job, their most important job is to be fathers to the children of God, so that all our children can grow to be the fullness of what they’ve been created to be, in the image of God, the Father. So to all you Fathers out there, may God grace you with wisdom, courage, knowledge and perseverance to be the husbands and fathers you’ve been called to be. Enjoy Father’s day, but most importantly, enjoy your children. To listen to more of Pedro's thoughts on fatherhood, click here.